So, I guess I need a new dog, yeah? Alright, so here's the plan. Phil and I have decided we will bide our time this winter, in hopes that my brother gets a full-time job in Cleveland and is unable to keep good care of the dog. You know, Archie. But… if he can manage a long, daily commute and the pup, we have a plan B. Plan B: When the snow melts in the Spring, we look for a new doggie and shell out the $50 a month to keep a canine in our apartment. We're not quite sure what kind we want… but we know that we don't want another Yorkshire Terrier, because we are quite certain no other little Yorkie can live up with Archie's legacy. We're thinking a small dog (up to 15 pounds, maaaaybe). Any suggestions, friends? The dog I have is 30 pounds and is a Welsh Corgi, I highly recommend them but that is more than 15 pounds. I would really like a Scottish Terrier or French Bulldog though. I have a Westie and while she’s cute and sweet and all, her white fur is a complete pain in my tush to keep clean. Westies really really like to dig (which is what they’re bred to do). She’s a totally cute pup, but she likes to dig and roll in the mud. It’s annoying! I have a little mauxie (1/2 miniature dachshund & 1/2 Maltese). She’s the cutest thing in the world! My parents have a Pomeranian and he’s a lot of fun. You would love a mini schnauzer like my Angus! (Looks very similar to Rhi’s Bloom). He is so smart and so hilarious! My friend has a cairn terrier (like Benji) and I’m telling you that dog is the cutest thing ever! Corgi’s are my favorite, but they’re more like 20-30 pounds. They are amazing though, have awesome fun personalties and love their humans a ton! my pup ‘Kingsley’ is a part maltese/yorkie. And if I was to get another dog it would definitly be a maltese. they are so happy and loving. and they don’t shed! I had a miniature poodle (without the frou-frou poodle haircut) named Jessie growing up. He never shed, was very loving and adorable, well mannered and easy to train. He was a great choice for a smaller dog! I have 2 little pocches both rescued from a shelter and they are the absolute best!!! I say don’t be too picky follow your heart and save a life. I lucked out with a bichon/poo like another reader mentioned and OMG she is soooo sweet, loving, adorable and does not shed. Visit a shelter or go on http://www.petfinder.com and see what comes your way!! whatever you get, definitely rescue! if you decide on a specific breed other than “mix”, then plug in that breed’s rescue and see what comes up in your area. i have boston terriers (rescued). perfect apartment dog. likes to walk, play, snuggle, sleep. won’t be upset if can’t go for a walk and won’t destroy house in retrospect. but some do get to be over 15 pounds. good luck with your decision! 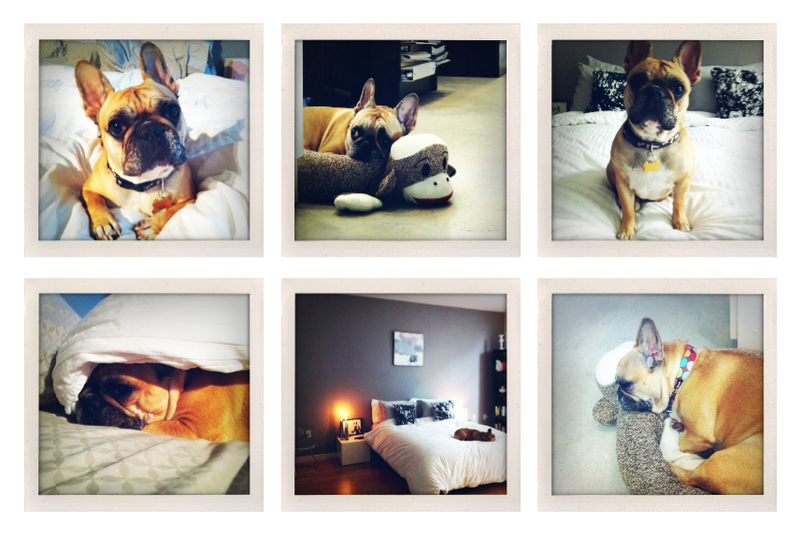 French Bulldog, French Bulldog! The cutest! My sister had a mini schnauzer and she was a dream! She was super smart, didn’t bark much and was fond of snuggling-which for me is a must! I have a greyhound and a shih tzu and I LOVE them so much. Obviously a greyhound is more than 15 lbs but our shih tzu is around there. He’s super smart, doesn’t shed and is so friendly! my husband and i have a miniature schnauzer and are madly in love with her! schnauzs do not shed, they are super smart, and they are not hyperactive though they love to go for runs and hanging out in the park if you are interested. they do great in apartments and were/are perfect for our living conditions and hobbies. check them out and let us know if you have any questions!! A Boston Terrier. They make great little apartment dogs. They are typically under 20lbs, very smart, fast learners, very low shedders, low maitnence, and have a vintage-y feel about them, lookswise. They also look adorable in little sweaters and T-Shirts. I have a Morkie (Maltese/Yorkie mix) named Lulu. She is the sweetest dog ever — so social and loving. I got her at Pets Pajamas in Fairlawn. They only buy dogs from legitimate breeders — no puppy mills. I have a Golden Retriever which clearly goes over the size you specified BUT i also have the most darling little girl who is a King Charles Caviliere. She is just precious and she is a toy breed. Pug pug pug pug!!! My big eyed Bernie is the sweetest most playful and loving dog ever. He is absolutely the love of my life, hands down!